Posted on July 5th, by mad121704 in Published Articles. 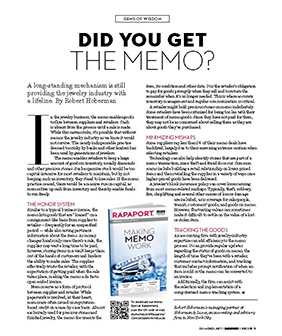 Robert Hoberman authored the article, “Did you get the Memo?,” which was published in the July 2018 issue of Rapaport Magazine. You can download or read the article here. In the jewelry business, the memo enables goods to flow between suppliers and retailers. Cash is absent from the process until a sale is made. While this carries risks, it’s possible that without memos the jewelry industry as we know it would not survive. The nearly indispensable practice deemed too risky by banks and other lenders has been used by generations of jewelers. The memo enables retailers to keep a large amount of goods in inventory, usually diamonds and other precious stones. Such expensive stock would be too capital-intensive for most retailers to maintain, but by not keeping such an inventory, they stand to lose sales. If the memo practice ceased, there would be a massive run on capital, as memos free up cash from inventory and thereby enable funds to run freely . . .